What Does Mark 12:6 Mean? The Lord Jesus told many stories and parables. Some were designed.. so that those whose hearts were hardened against the Lord, and His anointed Christ, would hear with their ears, but be deaf to its real meaning. They would have eyes to see, and yet would be blinded to the truth. They would hearken to the story but miss the message.. and fail to understand the glorious gospel of the kingdom, and the gracious offer of salvation, that came from the Lord of glory. Jesus started to deliver the mysteries-of-the-kingdom in parables - after the Jewish leaders had blasphemed the Holy Spirit, by accusing Christ of casting out demons by the power of Beelzebub. However, the meaning of some of His earlier parables were crystal clear. 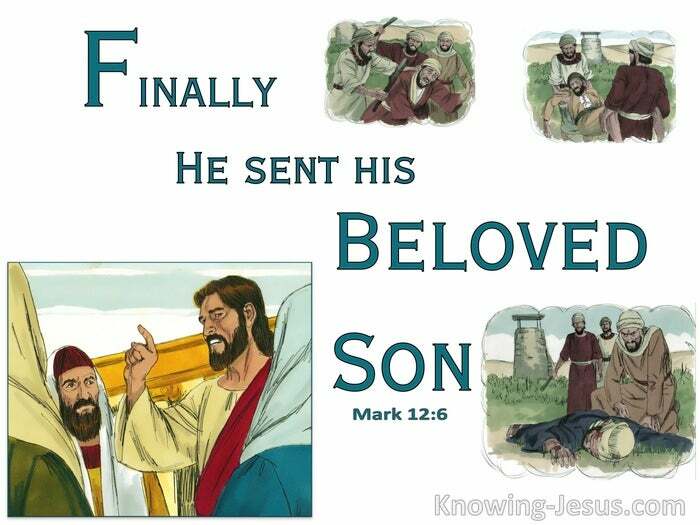 This meant that the Scribes and Pharisees understood that Jesus was referencing them, in a negative light.. in His some of His stories - and this parable, of the wealthy landowner and his murdered son, is one such story. Jesus relates a little tale of a wealthy, but absentee landlord, who decides to claim his rightful dues, from his tenants. They had been given the responsibility to oversee their lord's estate, and to care for his vineyard. After a long absence, he started to send various servants to receive his rightful remuneration. However, one by one.. the servants were refused, obstructed, abused and even murdered. 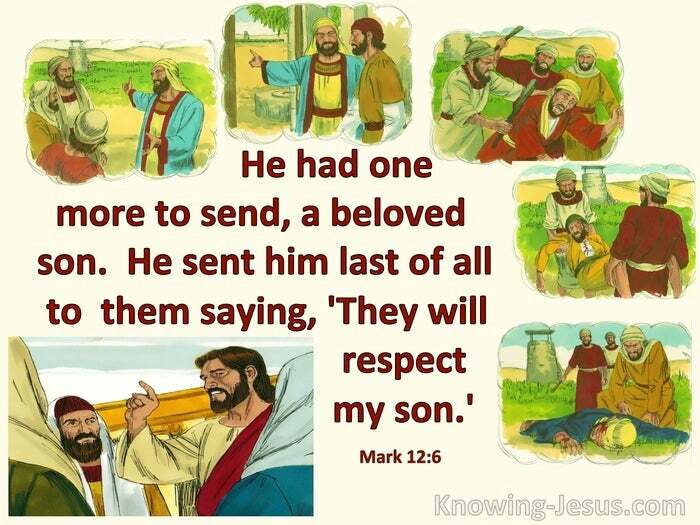 Finally, as we read in this verse, the owner of the vineyard had one more to send... a dearly loved son; whom he sent last of all to them, saying, 'They will respect my son.' But as we continue to read, we discover that he too.. was despised and rejected, beaten and scourged - treated with contempt and killed. 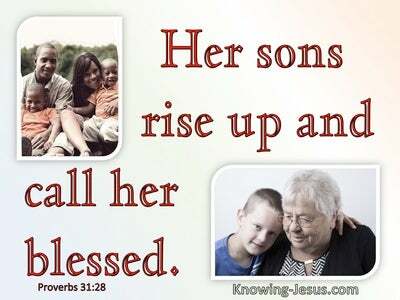 When the tenants saw the beloved son approaching, they plotted to kill him and steal his inheritance. The message of the parable was very clear. The father and the son of the story representing God-the Father and Jesus Christ, Whom He has sent while the tenants certainly symbolised the religious rulers. There was no question that Christ was referring to His own rejection and crucifixion. Throughout His ministry, Jesus applied various Old Testament scriptures to Himself, even identifying Himself as: the Stone which the builders rejected, Who has become the chief Cornerstone. That Stone is a stone of stumbling and a Rock of offence - such that all who believe on Him will not be disappointed. Scripture dictates, that those who fall on this Stone will be broken to pieces (i.e. 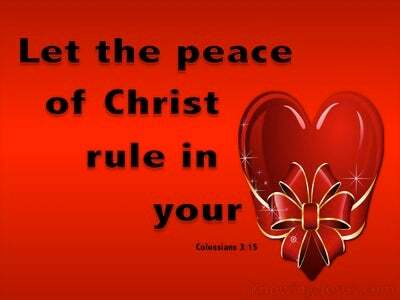 believers, whose independence, self-will and prideful 'self' is to be broken - because they trust in Him.) However, those upon whom this Stone will fall (i,e. 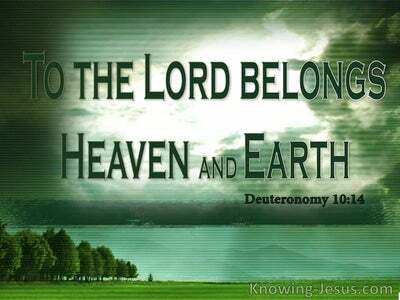 unbelievers,) will be shattered to pieces and scattered into dust. 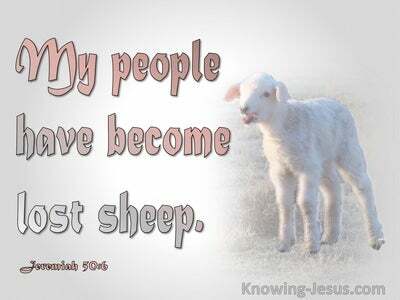 Jesus was sent initially and ONLY to the lost sheep of the house of Israel, to fulfil all the Messianic prophecies, of the Old Testament. During the first part of His ministry, He ministered specifically to the Jews.. in such a way that His mission and Messianic claims were undeniably clear. However, once He had been accused of casting out demons, by satanic power, His clear, Messianic proclamations, began to be shrouded in parables - so that those whose hearts were hardened against God and His anointed Christ, would hear with their ears, but be deaf to its meaning. . However, this story of the absent landlord and wicked tenants, was one of His clear, prophetic utterance.. which referenced His own death, and exposed the guilty murderers - who would plot His eventual crucifixion. We are privileged to have the whole council of God, written in the holy Scriptures, for our learning.. which is profitable for doctrine, for reproof, for correction, and for training in righteousness. May we read, mark, learn and inwardly digest its important truths, so that we do not miss all that the Lord is seeking to teach us.